Health And Tax Savings With A Salary-Sacrificed E-Bike! Did you know that you could salary sacrifice an e-bike? Why salary sacrifice an e-bike? Salary sacrificing a “company car” is a popular option, however did you know that there is also a tax and health incentive with another particular set of wheels — an electrically assisted bicycle (e-bike). An e-bike is defined as a bicycle-like frame fitted with an electric motor, which provides support when the rider is actively pedalling. The rider therefore is still getting exercise, but the effort is supported by battery power. As with unpowered bicycles, there is no requirement for registration or a driver’s licence. Where an employer enters into a lease with the bike company and the employer provides the use of an e-bike to an employee under a salary sacrifice arrangement, there is no Fringe Benefit Tax (according to a recently issued class ruling from the Tax Office). There are conditions for how the e-bike is used and also that the e-bike must always be the property of the bike company and at the end of the term of the lease the e-bike must go back. The beauty for the employee under these arrangements is that it simultaneously helps keep the pulse rate up but the tax rate down. The Tax Office says that the use of the e-bike however will be exempt as long as private use is restricted to travel to and from work, its use is incidental to work duties, or there is minor and infrequent non-work use. 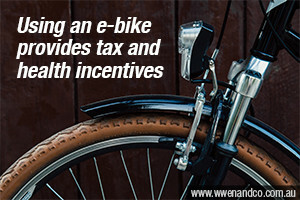 Therefore, there will be no Fringe Benefit Tax liability to the employer in providing e-bikes under these conditions. If you have any queries on e-bike and related FBT issues, please contact the Epping office of Chartered Accountants, W Wen & Co.